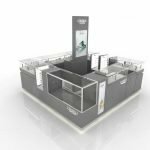 How to start a jewelry kiosk in a shopping mall? how much for a jewelry kiosk rental cost? Before you start a retail business in mall, you may have many questions like this. Especially for a business beginner who are the first time to access a retail mall kiosk. 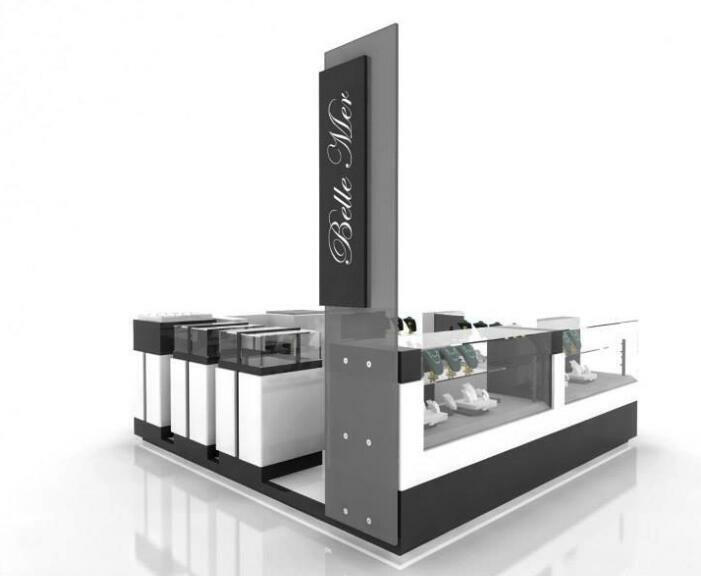 Whether you start a jewelry kiosk or a watch retail stall, you will need a nice looking kiosk design. This is the basic step but necessary procedure for all mall retail business. Even you start an in-line retail store. The design is also the most important step. 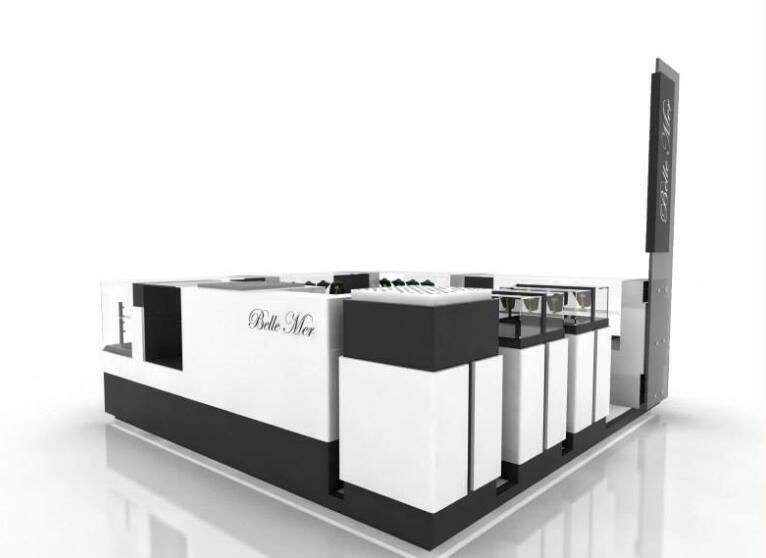 This is a white and black style standard jewelry kiosk display for the shopping mall. The bottom part of the kiosk is the storage cabinet build with high-quality plywood. We use Formica and Wisnurt Brand color-core lamination for the surface finish. Very strong and solid hard surface. As for the upper part of the kiosk showcase. Tempered glass is mostly used materials. With a circle of UL listed LED stripe around the top, You can easily create a bright and clean jewelry showcase space. All the jewelry display are placed on top on the display trays. If you need to add some spotlight to give some certain jewelry mannequins a special focus. We help you with that. 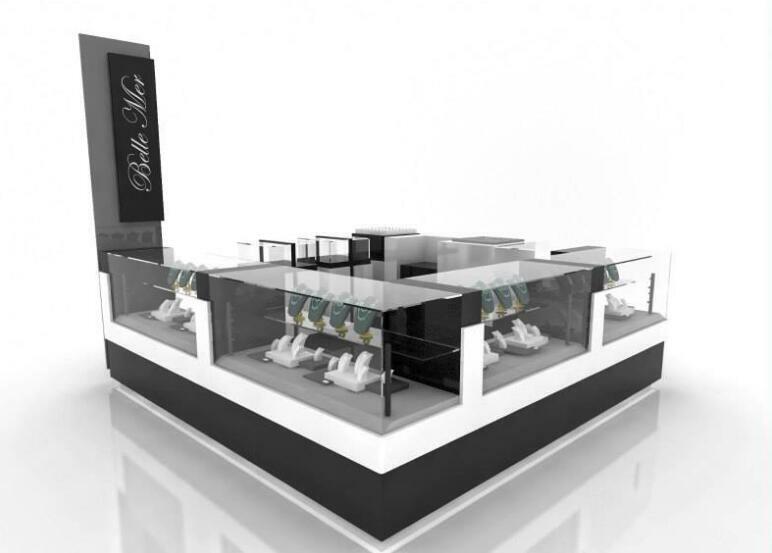 Jewelry kiosk dimension: 10*10 ft. if you need a customized size just need to inform us. Jewelry kiosk price: Cost to build this kiosk is $ 6800USD, different style and different size the price will also be changed. Kiosk Material: best plywood with strong lamination, UL list wiring with LED light. 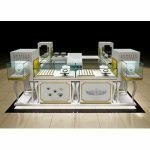 Unique Kiosk is a mall used retail kiosk builder specialized in high-level luxury display fixtures. 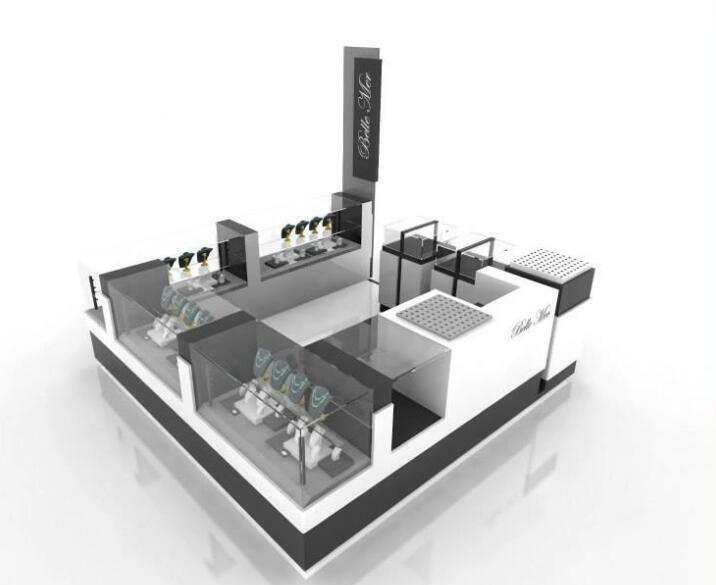 We not only design a retail kiosk but also manufacture it with the best materials. With a strong experienced work team. we can guarantee our clients a high end finished kiosk with affordable cost. Our factory based in China. but we shipped out kiosk all over the world. Especially for UK, USA, and South American cities. Contact us now for the best price .